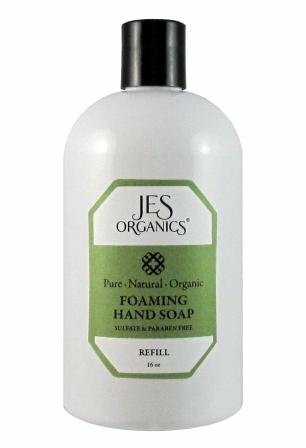 Luxurious Foaming Hand soap made with Organic Oils. Safe and non-toxic for all living things except germs! 16 oz. economical refill bottle. This is a really cool product. We make organic castile liquid soap and make it come out as a foam, like shaving cream. No propellants or chemical are used in the process, which forces the soap through a series of fine screens and mixes it with air. It has a wonderful feel and a smooth luxurious lather. You will quickly become accustomed to the luxurious feel of pure vegetable oil liquid soap foamed to perfection in a handy refillable dispenser. You will quickly become accustomed to the luxurious feel of pure organic oil liquid soap foamed to perfection in a handy refillable dispenser. We never use fragrance oils in any of our products. Only good quality essential oils are used to add a 'scent' to the productl.